He tried to think. The image of a burning heat melting his mind surfaced. He shook his head. Memories felt buried and looked blurry--dreams he could not remember. Happy happy book birthday to JED AND THE JUNKYARD REBELLION, the perfect companion to JED AND THE JUNKYARD WAR! 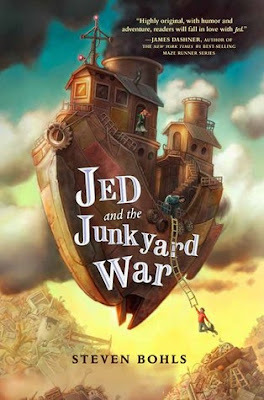 Quirky, magical, steampunk with genuine surprises combined with a fast plot and wacky world building make this a must read. The book reminded me of Serenity and Cinder; filled with danger and humor at the same time. 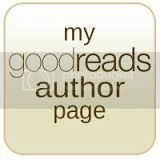 Themes of friendship, loyalty, temptation, choices, heroism, love, adoption and family will evoke discussion and thought. As Jed discovers his true potential, the reader is swept up in his journey and how he transforms from scrawny inept boy into a self assured, powerful, literal golden boy. 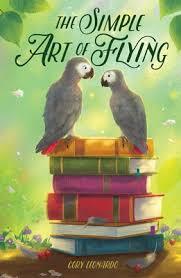 Happy happy book birthday to THE SIMPLE ART OF FLYING by Corey Leonardo--a breathtakingly beautiful book. The stunning cover, lyrical writing, and 3 points of view makes this a phenomenal debut novel. Since the story is told through poetry, prose, letters and a medical log, each character is distinct, complex and relatable. Fritz is the 12 year old aspiring doctor whose differences make it hard for him to make friends. His medical logs and interactions with other characters in the story help us understand his fears, his longing to connect with his father, and the price he's willing to pay for friendship. The book covers themes of grief, loyalty, hard work, friendship, family love, pet/owner relationships, freedom, depression, anxiety, and discovering that you've always had what you needed all along. 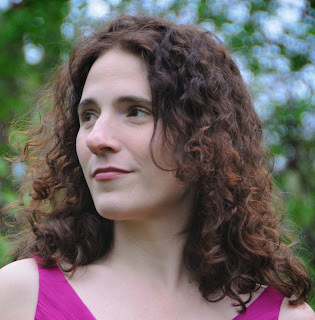 THE LOST GIRL by Anne Ursu Plus GIVEAWAY! "Thoughts fluttered frantically around Lark's head, looking for somewhere to roost. Iris was keeping things from her. Iris was sad. Iris was crying in camp. Iris was skipping camp. Iris had been wound up so tightly, and now she was unwinding everywhere. 'Something's wrong, Lark said quietly. 'really wrong.'" I read this stunning story about identical twin girls in one day. This magical book captivates with beautiful writing, complex characters, and realistic relationships. 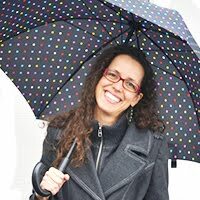 Anne Ursu does an incredible job of putting you inside the head of 5th grade girls. She interweaves a plot filled with mystery, emotion and humor. The book encompasses themes of doubt, fear, loyalty, love, family, friendship, monsters (literal and figurative), feeling different, and being ok with being different. To win a copy of this book, comment on this post. If you share on facebook or twitter, you get another entry. Giveaway closes in one week. When you’re an identical twin, your story always starts with someone else. For Iris, that means her story starts with Lark. Iris has always been the grounded, capable, and rational one; Lark has been inventive, dreamy, and brilliant—and from their first moments in the world together, they’ve never left each other’s side. Everyone around them realized early on what the two sisters already knew: they had better outcomes when they were together. When fifth grade arrives, however, it’s decided that Iris and Lark should be split into different classrooms, and something breaks in them both. Iris is no longer so confident; Lark retreats into herself as she deals with challenges at school. And at the same time, something strange is happening in the city around them: things both great and small going missing without a trace. As Iris begins to understand that anything can be lost in the blink of an eye, she decides it’s up to her to find a way to keep her sister safe. 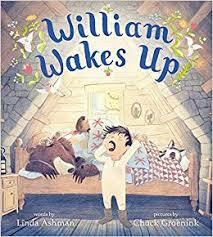 Happy Book Birthday to WILLIAM WAKES UP, by Linda Ashman and Chuck Groenink! It's a darling combination of THE LITTLE RED HEN and TEN LITTLE MONKEYS JUMPING ON THE BED. and says, "My friend will be here soon. we need a cake to celebrate!" 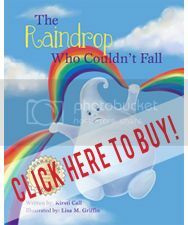 Expressive illustrations combine with the rhyming and lyrical text to make a delightful and whimsical read aloud. The premise of celebrating Spring with some spring cleaning, a cake, and a party with the birds is super fun--perfect read aloud for a wintry day when we need a little sunshine in our lives!